“Dress pitifully, and they recollect the dress; dress perfectly, and they recall the lady,” Coco Chanel said. Some weeks back I was in a program when one of the speakers made eyes pop when she stepped out on the podium for her speech wearing a very revealing mid-thigh dress. She was a medium height woman, not too much flesh and she was in heels. So, technically, she was unable to get away with her appearance looking scandalous. Two ladies sitting next to me argued about her looks. One said, “See, what she’s wearing. What is she going to talk to me about class?” the other lady empathized with the speaker, “Awww… don’t say that. I think it’s her big bum that pushed up the gown drastically to the middle of her thighs.” If I’m to judge the situation of this speaker, her appearance detracted from her image and what she has to offer. She could have created less attention on the mid-thigh dress by playing it down with kitten heel shoes if at all she has to wear the mid-thigh dress and heels by all means. Experts say there's a fine line between classy and trashy, whatever a woman's age. So, is showing a lot of legs out rightly bad? I would say no. 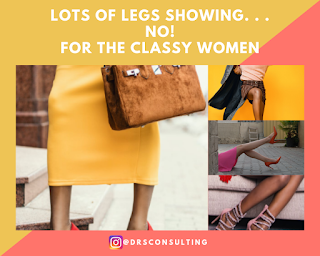 It has to be done in a way that is classy and suits your body and position. You can get away with this sort of dressing at the "anything goes" kind of event. But, when you are in a place of authority, this can be deemed disreputable. Your dress should stop above the knee, mid-knee, but not mid-thigh. Show off your legs spectacularly well and not excessively disgusting.